Change your vision, change your life. A state of the art surgical care center, the Eye Surgery Center of Michigan is the first facility if Metro Detroit to offer Blade-less Laser Cataract Surgery. Come on in and look at life with a new clear view. 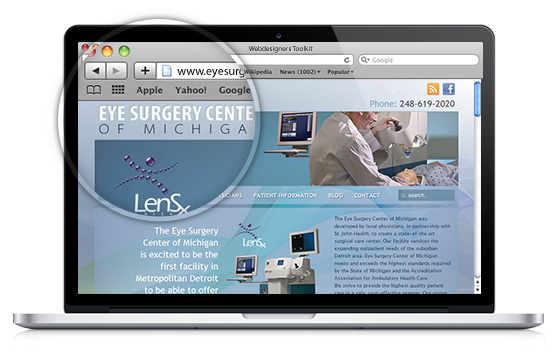 The vision was to establish Eye Surgery Center of Michigan as the best place for eye surgery needs. The client wanted us to showcase the technological advancements in eye surgery, as well as state the experience of their dedicated physicians. OMA Comp placed the LenSx Laser right on the home page of the new site. We needed to make a strong statement on just how advanced the surgical center is. A list of physicians that rotates on every visit can also be found right on the home page. A clean and clear design match perfectly with the clarity you receive at the Eye Surgery Center of Michigan. OMA Comp was honored to help clear the way.